Last week, the Tuscon branch of Veterans on Patrol found a mysterious tunnel near 1-19 and Valencia while scouring the area for homeless veterans. On Tuesday, the group stumbled upon the bunker. “I didn’t expect to find something this heinous and inhumane this close,” said Craig Sawyer, a former Navy SEAL and member of the group. 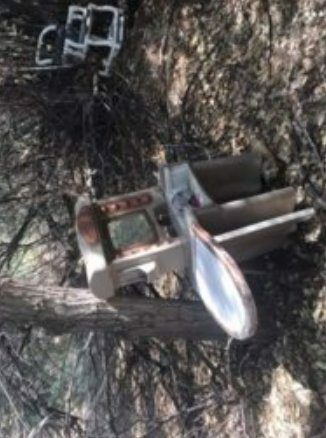 The group found restraints on trees, hair dye, children’s items and pornographic magazines. After alerting local and federal law enforcement about the situation and receiving no help, the group rallied local volunteers together to physically dig up the site. Veterans on Patrol has amassed a groundswell of support, and has vowed to keep the uncooperative law enforcement entities out of the site while they conduct a private investigation. They are hopeful to bring cadaver dogs on site to search the area. The situation came to a head this afternoon when, according to the group, they dug up a bloody knife, female underwear, and the plane ticket of a potentially missing girl from Seattle. The group is trying to contact the girl’s family for verification. They filmed the finding live on Facebook, and shortly thereafter, the police showed up and arrested two members of the group for trespassing. Arthur, a Pastor, suggests in one of the videos that the group suspects that bodies may be buried in the bunker. The group has been dispersed by law enforcement, but Arthur and another member are remaining on what appears to be a tower to oversee the site, setting up a possible confrontation with police. The group was apparently confronted by suspected cartel member riding on horseback who asked to go into the bunker and retrieve his tools, according to one of the videos on the page.